An example of the frequent use of personal names to create surnames, this name is from the Old French personal name "Humfrey", introduced to Britain by the Normans after the Invasion of 1066. It is derived from the Germanic elements "hun" meaning "bear cub" and "frid" or "fred" meaning "peace". St. Humfrey, the 9th Century Bishop of Therouanne, had a certain following in England among the Norman settlers, and no doubt this contributed to the popularity of the name. Interestingly, until the early 14th Century, the name appears to have been confined to the nobility and the learned sections of the populace, such as scribes and scholars in great houses and monasteries. 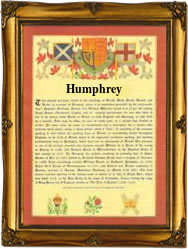 As a personal name, it appears in the Domesday Book of 1086 as "Humfridus". Recordings from London Church Registers include the marriage of Christopher Humphrey and Susan Gore on December 8th 1586, at St. Benets. A Coat of Arms granted to families called Humphrey in Barton, Northampton, and Shipson, Leicester is a red shield, a cross botonee silver quarter pierced of the field, charged on each end with three black escallops, the Crest being a silver harpy crined gold, wings displayed gold. The first recorded spelling of the family name is shown to be that of William Humphrey, which was dated 1240, in the "Fines Court Rolls of Bedford", during the reign of King Henry 111, known as "The Frenchman", 1216 - 1272. Surnames became necessary when governments introduced personal taxation. In England this was known as Poll Tax. Throughout the centuries, surnames in every country have continued to "develop" often leading to astonishing variants of the original spelling.